ELLEN GOLDSTEIN was born in Charlottesville, Virginia. 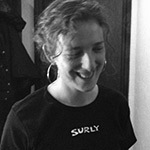 Her work has appeared in StorySouth, Measure, Mid-American Review, The Common, and elsewhere. She lives and works as an editor in Eastern Massachusetts.